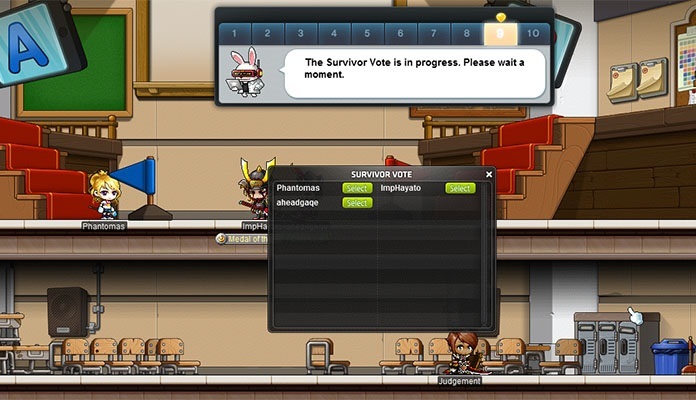 Show Off With Showdown Events: February 6 – February 27 | Dexless, Maplestory Guides and More! Discussion in 'Maple Updates' started by Nexon, Feb 6, 2018. Show off your strength with The Legends Return! 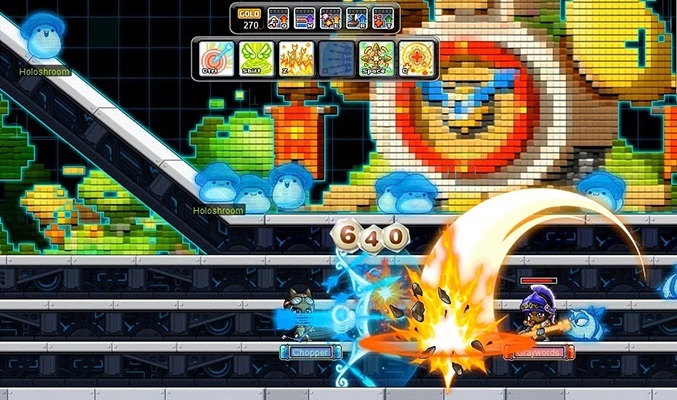 In this event, players compete 3 on 3 in a PvP style brawl. Players Lv. 33 and above can begin by clicking the event notifier on the left side of the screen, and accepting the quest ‘The Legends Return!’ from NPC Cynapse. You will be moved to the waiting room map. Once inside, select an avatar to become one of six Maple Legends. Choose from Grendel the Really Old, Manji, Mike, Mu Gong, Dark Lord, Athena Pierce, Moonbeam, and now—Ryude, the hero of Winter Bard! 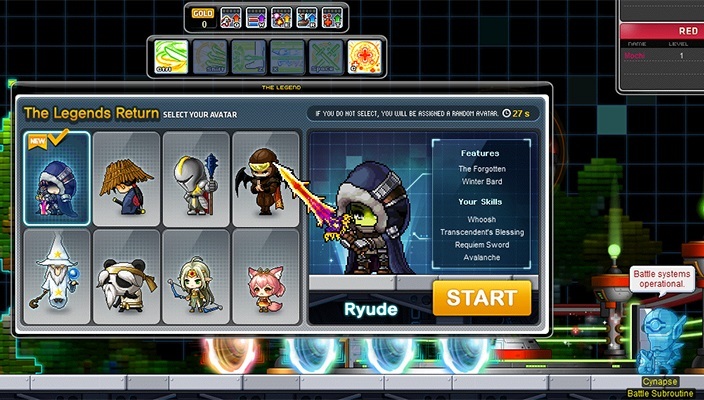 Each Maple Legend avatar comes with its own set of skills. You can level up your skills by defeating players on the opposing team, or by taking down monsters that appear in the map. The team to defeat all members of the opposite team in the final round will be declared the victor, and will receive Magpie Coins to redeem in the New Year Coin Shop! You can receive up to 50 Magpie Coins from this event per character per day. Show off your mind with the new Divine Intelligence event! Players Lv. 33 and above can begin by accepting the invitation that appears above your character’s head at the 30-minute mark of every hour. You will be moved to the event map along with up to 49 other players. 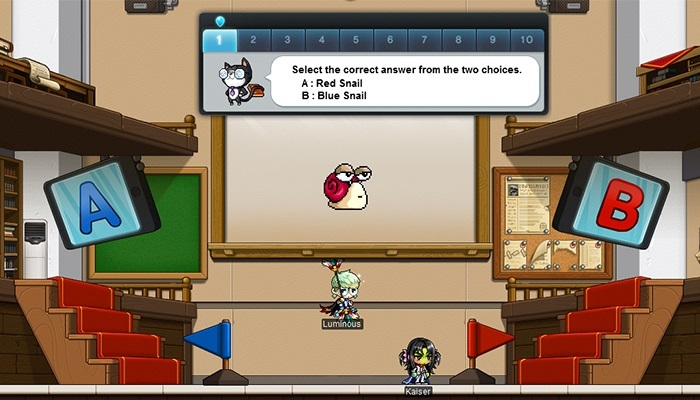 This mini-game tests you on identifying Maple monsters and rewards you with points depending on how many you answer correctly. To answer, you must quickly move to the area of the map displaying either “A” or “B”. You earn points when you answer questions correctly. Each game consists of 10 stages and 1 random question is displayed for each stage. The questions get harder and faster as the stages progress. If you are disqualified, you can still participate by voting for your favorite player remaining in the game. If your favorite player is still standing when the stage ends, you will receive a percentage of the points. The favorite player also receives extra points based on how many players vote for them. You can participate in the event up to 5 times per day. Keep track of your success with a special title that records how many times you answer correctly! Collect those points and then exchange them for nice rewards! Ramblings of a Genius Coupon: Gives Ramblings of a Genius effect that can be toggled on/off via a hotkey. Gym Cat's Gift Buff Coupon: Gives a buff that grants Weapon ATT/Magic ATT +30 for 30 minutes. Can be purchased once per day. Ursie's Gift Buff Coupon: Gives a buff that grants EXP +50% for 30 minutes. Can be purchased once per day. Iron Rabbit's Gift Buff Coupon: Gives a buff that grants Weapon ATT/Magic ATT +50 for 30 minutes. Can be purchased once per day. Lightning's Gift Buff Coupon: Gives a buff that grants EXP +100% for 30 minutes. Can be purchased once per day. Epic Potential Scroll 50% Coupon: Gives Epic Potential Scroll 50% (x5). 7-day duration. Coupon is usable until March 5 at 11:59 PM (UTC). Master Craftsman's Cube: Untradeable, 7-day duration. Can be purchased once per day. Meister's Cube: Untradeable, 7-day duration. Can be purchased once per day. Divine Intelligence Researcher: Medal. 30-day duration stats. STR/DEX/INT/LUK +3, Weapon ATT/Magic ATT +3. Participate in the event 10 times to receive the title. Divine Intelligence Lead Researcher: Medal. 30-day duration stats. STR/DEX/INT/LUK +7, Weapon ATT/Magic ATT +7. Participate in the event 20 times to receive the title. Divine Intelligence Chief Researcher: Medal. 30-day duration stats. STR/DEX/INT/LUK +10, Weapon ATT/Magic ATT +10. Participate in the event 30 times to receive the title. In addition to items, you can also trade your points for mesos at a 1:100 ratio for a maximum of 5,000,000 mesos per day. Manji - Old Samurai dude. Has his own questline and weapon and stuff. Mike? - Janitor Sleepy Guard?